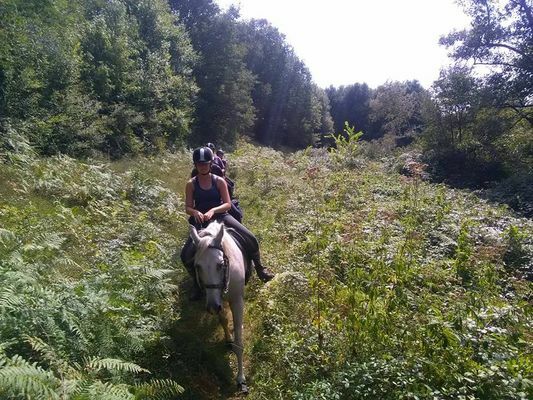 Come and meet Lenora and Yann and discover a new way of life that combines horses and nature! This centre offers its horses a way of life which is as close to nature as possible; they do not wear horeshoes and live in the prairies separated only by their natural affinities. Their natural requirements are a priority for Lenora and Yann. Work on foot, clicker training, freedom, the provision of care, manoeuvres, riding in the countryside, trekking, jumping, obstacle courses, riding on a variety of different terrains, dressage, riding with a “cordelette”, “western style” introductory courses, “equifun”, pony games, introductory courses in vaulting... so many possibilities for spending a pleasant day among horses. Facilities at your disposal: round pen, outdoor arena, small riding arena, courses on various types of terrain, tack room with equipment adapted to each of the horses. Different prices are available for club members. Tips for the Sud-Vienne-Poitou: if you own a horse yourself, this centre can help you break it in or do it for you. That little extra something : another approach to horse welfare. There is no review about Centre Équestre Au Pré Des Chevaux, be the first to leave one !